Bad Credit Car Loans Toronto- A Better Way To Solve Financial Problems! Bad Credit Car Loans Toronto- A Better Way To Solve Your Financial Problems! GETTING CASH IS EASY WITH SNAP CAR CASH! Bad Credit Car Loans Toronto – We are always here to turn your car into cash to tackle the financial crisis. 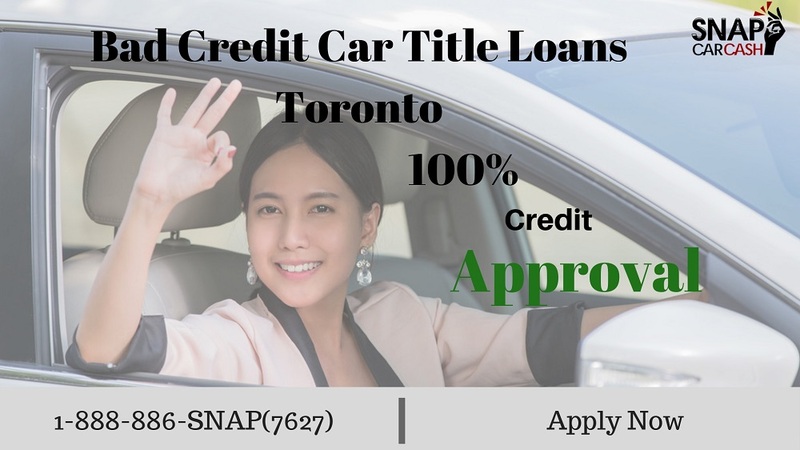 Snap Car Cash is serving the many locations in Canada with the most convenient car title loan services for years. A car title loan allows you to use your vehicle’s value to get the fast cash you need today. Whenever an unexpected expense disturbs your life in bad credit car loans Toronto is the best option to obtain the needed money quickly. This is the process, where an asset is required as collateral, and beneficial due to two key reasons. First, it does not matter if you have bad credit or no credit, credit history or rating is also not required with Snap Car Cash. Second, anyone can be approved very quickly for loan amounts from $1,000 to $50,000 with the least requirements and easy documentation. What do you need for loan approval? What are the benefits of title loan with us?